The recent Chikungunya (CHIKV) epidemic (2006) unleashed an unrecognized spectrum of rheumatic muscu- loskeletal (RMSK) pain and disorders. The data on persistent RMSK is lacking. About 10% clinical acute cases are considered to suffer from chronic arthritis. We used an arthritis camp approach in a 9000 populated village Modnimb (district Sholapur) in December 2007 to identify naοve cases of RMSK following symptomatic CHIKV outbreak in December 2006. A 10-day intensive publicity through public announcement and media pamphlet distribution pro- gram was carried out to attract villagers with persistent aches and pains and a past history of acute CHIKV illness to attend a 3 day free of cost evaluation arthritis camps. Blood samples were collected from consenting patients. Village volunteers and health workers participated in it. 1.4 percent (95% confidence interval 1.13, 1.60) village pop- ulation was found to suffer from naοve persistent RMSK pain and disorders at 1 year following acute CHIKV infec- tion. Patients were generally > 45 years age and females were predominant. Knee was the predominant pain site in 79% cases. Though 27% cases suffered from non-specific arthralgias (NSA), the diagnosis in 48% and 15% cases respectively was consistent with OA (often knee and spine) and undifferentiated inflammatory arthritis (0.2% crude prevalence). Overall, the clinical RMSK profile was benign and none reported any significant functional disability or mobility impairment. Seventy-three percent patients tested seropositive for anti-CHIKV IgG antibody; none for IgM antibody. None showed any abnormality on routine laboratory haematology and biochemistry testing; seropositive RF, ANA and anti-CCP was infrequent. Though CRP values were low, IL-6 was elevated and was not associated with any clinical phenotype. As compared to normal healthy population values assayed a year prior to the epidemic in a neighboring village, cases with persistent RMSK showed elevated IFN-γ, TNF-α and IL-13. Also, the clinical pheno- type and cytokine expression did not seem to differ between the seropositive and seronegative groups for anti-CIKV IgG antibody. Conclusion: In this rural community study, at least 1.4% population continued to suffer from some form of RMSK at 1 year following acute CHIKV epidemic. Though clinically unimpressive, a large number showed elevated pro- inflammatory cytokine expression. A longer follow-up may explain this disconnect. Objectives: 1. Primary objective: To study the clinical profile of acute Chikungunya fever. 2. Secondary objectives: To study the clinical profile of chronic sequelae and response of these patients to treatment. Methods: One hundred and fifty adult patients who presented with a triad of fever arthralgia and rash during the period of June-December 2007 to the outpatient department of Medical College Calicut were considered for the study. They were followed up for 18 months or till symptoms subsided by direct examination as well as telephone interviews. There were no drop outs. Further follow-up of those in whom symptoms persisted was done, Exclusion of other rheumatologic disorders was done clinically and by relevant investigations Data was analyzed using SPSS statistical package. Results: One hundred and thrity-four patients had typical clinical features of Chikungunya and 122 tested positive for IgM chik V capture ELISA. Hundred of them who were traceable were included in follow-up group with an age range of 20-60 years; 60% of them were females. A biphasic pattern was noted for the disease with first surge dur- ing July-September (60% of cases) and second surge during December (15% of cases). Fever was present in 96% Arthralgia was present in 100% of the patients and arthritis in 78%. Acute arthritis resolved within seven days in most of the patients. Ankle and small joints of hand were the joints most commonly affected. Ninty percent of the patients had symptoms beyond three months. In 14% of patients arthralgia persisted for 3-6 months, in 32% for 6-9 months, in 22% for 9-12 months, and in 22% for more than 1 year. Antimalarials were effective in decreasing the duration of disease; 5% of chronic Chikungunya arthritis evolved into rheumatoid arthritis. Conclusions: In our study causes arthralgia was present in 100% of Chikungunya patients, arthritis in 78%, skin rash in 68%, and 22% had persistent symptoms. Antimalarials and short courses of steroids may be useful in a subset of them. Chikungunya arthritis evolved into rheumatoid arthritis in 5% of our patients. Introduction: Leprosy classically presents with cutaneous and neurological involvement, though musculoskeletal symptoms may be the initial symptom. 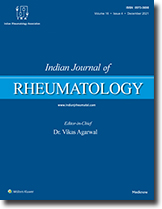 Methods: The study was conducted on 102 patients with leprosy to determine the prevalence and spectrum of rheumatological diseases in this group. Eighty four patients were referred from leprosy clinic and 18 patients presented first in rheumatology clinic with arthritic symptoms and were later diagnosed to have leprosy. Results: In the first group, symmetrical polyarthritis involving the large and small joints, similar to rheumatoid arthritis was the most common manifestation. Whereas in the second group, tenosynovitis was the commonest presentation. Rheumatoid factor was positive in 72 (70%) cases. Discussion: Variety of musculoskeletal symptoms were found in patients with leprosy and many of them were associ- ated with Lepra reaction. Objective: Infections are not uncommon in rheumatology practice both because of the disease by itself and the medications used especially after the advent of biological therapy. Identifying and predicting infections is crucial in managing these patients as sometimes they are indistinguishable from the disease itself. The present retrospective study evaluates the clinical spectrum of infections in patients of rheumatology. Methods: Medical records of patients from the January 2007 to June 2008 were retrieved. The data of patients with serious infections requiring hospitalization or infections diagnosed after hospitalization, concomitant medications, co-morbid conditions, previous infections, and any other predisposing factors were analyzed. Inclusion criteria: All patients who were admitted at the rheumatology department and have had evidence of minor or major infections were included. Results: There were a total of 1236 admissions, of which 225 patients had infections. Eighty-four were systemic lupus erythematosus (SLE) patients, 72 were rheumatoid arthritis (RA) patients, 69 patients fell in the others group, and there was one patient who had RA-SLE overlap. Fever was the presenting complaint in 69 (82.1%) patients with SLE and 43 (58.9%) patients with RA. Lower respiratory tract infection comprised 22.9% of SLE infections, 32.5% of RA infections. Bacterial infections (21.27%) are common infections and Escherichia coli is the most common organism identified in SLE. Conclusions: Infections are the common cause for hospital admission in RA and SLE. The commonest site of infections is the respiratory tract in both RA and SLE. The occurrence of infections in SLE is not directly proportional to the level of immunosuppression. Introduction: Infection can present either as articular problems or as complicate on undergoing rheumatological disease. Methods: A retrospective analysis of 1900 inpatients admitted over a 2-year period was done. Infections in these patients were analyzed. Results: Around 0.21% of the patients had septic arthritis, 0.68% had tuberculosis, 0.95% had reactive arthritis, and 0.57% had post-viral arthritis. Bacterial, viral, and fungal infections were common in patients on immunosuppres- sives, on high disease activity, with diabetes, and with poor renal function. Escherichia coli and Klebsiella pneumoniae were the common infection. One third of all cases of tuberculosis (TB) are extrapulmonary (EP) and less than 5% of these are associated with musculoskeletal (MSK) system. TB can infect MSK at several sites (spinal/axial and extra-axial/peripheral) and present with multifocal damage. Inflammatory rheumatologic disorders and immunosuppressive therapy may further compound the problem. A high index of suspicion is required. Modern imaging and microbiology-serology techniques provide early diagnosis with improved prognosis. All this was demonstrated by a retrospective analysis of case records of 23,651 patients examined in a single rheumatology center in Pune during the period 2005-2009. The study used the patient referral database to retrieve data and perform analysis. Thirty-five percent of the total cases were classified as rheumatoid arthritis (RA). Ninety-eight cases recorded TB in the case record either as a past illness or primary illness, or concurrent complication. 0.4 percent cases of RA developed TB which was predominantly pulmonary. TB affected MSK in 16 cases (0.07%) with 12 cases suspected of Poncet's disease. Two cases (1 with RA) were diagnosed as multifocal (with non-contiguous spinal disease, psoas abscess). One case each of tubercular infection of the breast and wrist (both rare forms) was associated with inflammatory arthritis. One case each of primary MSK tubercular infection of wrist extensor tenosynovitis and monoarticular knee synovitis was also recorded. TB lymphadenopathy was the commonest manifestation of extrapulmonary tuberculosis (EPTB). Though infrequent, TB remains an important differential diagnosis in rheumatology setting. Tuberculosis (TB) arthritis accounts for approximately 1-3% of all cases of tuberculosis and for approximately 10-11% of extrapulmonary cases. The most common presentation is chronic monoarthritis. The Poncet's disease is a reactive symmetric form of polyarthritis that affects persons with visceral or disseminated TB. TB arthritis primarily involves the large weight-bearing joints, in particular the hips, knees, and ankles, and occasionally involves smaller nonweight-bearing joints. The diagnosis of TB arthritis is often delayed due to lack of awareness, insidious onset, lack of characteristic early radiographic findings and often lack of constitutional or pulmonary involvement. A high index of suspicion is necessary, especially in the context of persistent monoarthritis and synovial biopsy and prompt anti-tubercular therapy with adequate doses and duration prevents joint damage and preserves joint function. Surgical procedures should be restricted to joints with severe cartilage destruction, large abscesses, joint deformity, or atypical mycobacteria. In tropical countries infections are an important cause of morbidity and mortality. Even in tertiary care centers, infections constitute a main cause of morbidity occurring among immunocompetent and immunosuppressed hosts. Here we review the common acute and chronic bacterial infections namely septic arthritis, tropical pyomyositis, tuberculousis, and leprosy-associated arthritis in an immunocompetent host. Septic arthritis presents as acute hot swollen joint and usually occurs in the knee caused by a Staphylococcus aureus infection. Immediate diagnostic tap followed by appropriate antibiotics and drainage results in complete cure. Tropical pyomyositis presents with fever, malaise, and muscle tenderness and/or swelling. Ultrasound will reveal altered echotexture of muscle with or without pus collection. In more than half of the patients multiple muscles are involved. This again is caused by S. aureus in majority of the cases and responds well to antibiotics and drainage. Patients with co-morbidities may have a poor outcome. Chronic monoarthritis involving knee is the most common presentation of tuberculous arthritis however, oligoarticular or polyarticular involvement is not uncommon. Constitutional symptoms or other sites of active tuberculosis are not common. Synovial histology revealing granulomas or mycobacterium bacilli is diagnostic. Leprosy can present with polyarthritis, swollen hands and feet syndrome, erythema nodosum or fever simulating vasculitis, and even lupus. Careful attention to hypoasthetic cutaneous lesions and thickened peripheral nerves may help in clinching the diagno- sis of leprosy. Rarely is pure neuritic leprosy associated with arthritis and when present may require a nerve biopsy for diagnosis. Rheumatologists need to be aware of these infections as these are potentially curable. Brucellosis commonly presents as pyrexia of unknown origin. However, it can also present with the involvement of reticular-endothelial or skeletal system wherein sacroilitis, spondylitis, arthritis, and osteomyelitis are the common presentations. Osteoarticular manifestations are often under diagnosed due to a low index of suspicion, and tempo- rary response to symptomatic treatment. This can lead to a chronic incapacitating disease. Being treatable, it is important to identify them early and institute appropriate therapy. Diagnosis can be achieved by bacterial isolation and/or serology. New culture methods and molecular techniques can be useful whenever available. Treatment with antibiotics and surgery when indicated can help prevent the incapacitation and crippling, which otherwise results due to progressive disease. Elimination of animal brucellosis is the only way of prevention of human brucellosis. A safe and effective vaccine for human use is the future hope. Accurate diagnosis in osteoarticular tuberculosis poses a difficulty due to deep inaccessible lesions, paucibacillary state, and initiation of empirical ATT in most of the cases. Diagnosis of osteoarticular TB evolved from clinicoradio- logical to serodiagnosis to detection of DNA/RNA of MTB origin. Newer modalities which aid in early diagnosis and treatment go a long way in management of osteoarticular TB by significantly decreasing morbidity. Subjecting all cases to panel of investigations including AFB staining, AFB culture/sensitivity, PCR, and histopathology on obtain- ing tissue have been proved more efficacious than resorting to single test. In particular serology alone is not diag- nostic. High sensitivity and specificity of PCR and histopathology are found to be most useful diagnostic modalities in studies. Thus gold standard remains to be tissue diagnosis. Patients with autoimmune inflammatory rheumatic disorders have a higher incidence of infections indicative of inher- ent immunosuppressed state related to the disease activity. The latter is made worse by DMARD, including steroids that are universally used to treat these disorders. The problem has been compounded further with increasing world- wide use of biological response modifiers (BRMs or biologics) for the treatment of systemic inflammatory rheumatic diseases, especially rheumatoid arthritis (RA). To some extent, this was predicted considering that most BRM used in rheumatology practice specifically target molecules involved in the functioning of innate or adaptive immune sys- tem of the host defense system. The adverse effects of BRM, however, need to be balanced against their remarkable efficacy in disease control. BRM are highly effective drugs that have revolutionized the treatment of these diseases. In this paper the current status of infection with the use of BRM in rheumatic diseases is discussed. On balance, biologics seem to be safe drugs with acceptable range of drug-related infections. The preponderance of data indicates that TNF inhibitors (iTNF) are associated with a small increased risk of serious bacterial infections. The most common associated infections are urinary tract infection, pneumonia, upper respiratory infection, and soft- tissue/skin infections. Available data strongly suggest an increased risk of tuberculosis-flare with iTNF medications, especially the monoclonal drugs and has been discussed separately. Though sparse and grossly limited, the Indian data has been reviewed. Stringent screening is required for TB and other community infections prior to initiating BRM.